It’s a bitter cold day and you’re running late for work when you discover your garage door is frozen shut. In your haste, you’re forced to tug at the door manually, which aside from being hard work can actually damage the door’s rubber seal. We specialize in garage storage, not garage doors, but this much we know: the solution to a frozen garage door is prevention. Keep the area where your garage door meets your garage floor completely clear of snow and ice. Sprinkle a little table salt over the entire length of this meeting point to prevent the rubber seal from freezing to the ground in the event any moisture freezes over. One treatment won’t last all winter, so store a tub of table salt in your garage for easy access, and reapply salt from time to time. 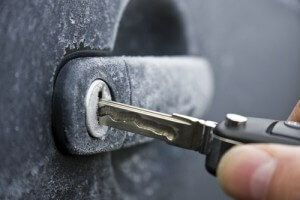 While we’re on the subject of frozen doors, you may also want to spray your car doors and trunk hinges with WD-40. Using the WD-40 straw, give the locks a liberal dose, too. Reapply periodically. While this will minimize chances of freezing, it’s no guarantee, so keep a small bottle of de-icer on you at all times.